Teaching your child how to count and work with numbers is the starting point for teaching them basic mathematics. The ability to count and tell different numbers apart is the core skill needed to learn fundamental math operations like addition, subtraction, multiplication, and division. Counting is important because children need to learn the meaning attached to a number (e.g. nine) with the concept behind it – that is, what nine units of something means and looks like in real life. As adults, when we count, we do this automatically. With the right techniques and plenty of practice, your child can also achieve this level of conceptual understanding and move on to more advanced math early. Here are 8 powerful activities to help your child master counting and get started on their journey into math! Equipment: Whiteboard, duster, erasable marker. a. Starting from 1, ask your child to say each of the numbers out loud, form the number with the fingers, and finally write the numeral down on the whiteboard. b. Now spell out a number on the board and have your child identify the right numeral for it. Equipment: A pair of dice. Roll a die and point to the face on top. Have your child count off the number of dots on the face with their forefinger. Repeat this exercise for the other faces. Now roll both dice and repeat the same exercise for numbers up to 12. This activity will help them count units and associate the spatial arrangement of the dots with the number in their mind. Equipment: Marker pens of coloured ink, whiteboard. Using markers of different colours, draw outlines of basic geometric shapes like squares, circles, triangles, and pentagons on the whiteboard, a single shape for each number. Then have your child choose the right colour and fill in the shapes while counting out the number of units of each shape. This will further strengthen their visual number sense while teaching them how to count units in different spatial configurations. Teach your child the following rhyme and join them in a sing-along. If possible, show them pictures corresponding to each visual as they recite the rhyme. Equipment: Stock up a room with several items of a kind. This activity is intended to introduce your child to visualizing groups and sets of objects of a kind and count them together. Ask your child to explore the surroundings and count X items of a kind; e.g. 2 pencils, 3 sharpeners, 4 books, 5 hats, and so on for each of the numbers. Make sure you have placed the items some distance from each other at various locations in the room. Equipment: A poster similar to the one shown here; whiteboard, markers. Pin up a chart similar to the one below, showing a series of objects arranged in groups of numbers up to 10. There are two types of objects in each pair. Have your child study each pair in turn. Ask them to count the number of objects on each side, and then correctly identify the relationship between the numbers in the two boxes. For example, are there more angry red birds than angry black birds? Are there as many pigs as there are birds? Now put away the chart and write down ten pairs of numbers on the whiteboard with a space between them. Ask your child to compare the numbers in each pair and tell you which number is larger than the other. 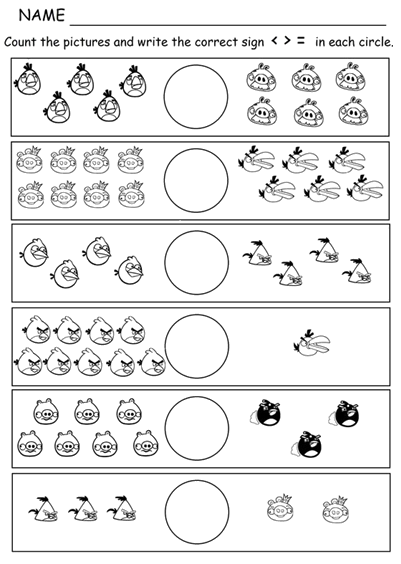 This activity will teach your child how to compare numbers and the relationship between them, the conceptual understanding necessary to learn addition and subtraction. Equipment: Whiteboard, markers (demonstration only). Make four vertical marks on the board and strike through them with the fifth line as you count the marks out aloud. This forms a set of five. Repeat the exercise for numbers 6-10. Tell them one group or bundle represents 5, while the two groups or ‘bundles’ taken together represent 10. This activity familiarizes the child with the concept of tallying and prepares them for the tally charts they will learn in later years. It’s also an early lesson in multiplication. Draw a unidirectional number line as represented and mark the numbers 1-10 on it from left to right. Now erase the numbers 4, 6, 7, and 9 off the line and have your child fill in the missing numbers while counting from 1 to 10, moving their hand from left to right (do not include a zero on the line as children at this age will struggle with the concept of null/zero). Teaching your children how to count up to 10 and learn all about numbers can be a fulfilling experience. But you don’t need a classroom to do all this. Download the PlayAblo app or visit https://web.playablo.com/ today to discover fun new ways to teach counting on a computer or on your mobile – make every moment a learning experience for your child!